So yeah, fellow Rocket From The Crypt fans who spend a lot of time on eBay, it was me. I'm the one that picked this up for $325. I haven't dropped that much scratch on a single record in a really long time, but at this point there aren't many Rocket From The Crypt records I don't already have squirreled away in the archive. This is the third variant of the Gold 7". The normal one was limited to 500 copies. There were also a version that came packaged with some plastic beads. The rumor has always been about 50 of these were released. This final version was limited to only twelve copies and were hand numbered as being "No Funk." This one that I grabbed is number seven. It has a completely different sleeve with the words "There will be no funk in outer space" printed on the cover. I had heard rumors of this version for quite some time, but for years there wasn't any real proof that it actually existed. A picture of it finally ended up popping up on the John Pette Rocket discography page, so the hunt was on once that happened. I'm actually kind of surprised one turned up, I didn't think I'd ever have the chance to buy it. Oh, and don't worry, I didn't actually open it. I grabbed the record out of one of my other copies to take a picture of. The song itself isn't even one of my favorites. "Gold" is an MC5 cover and is a noisy, shouting mess of a song. There's a certain charm to it and I do kind of miss those early Rocket From The Crypt days when they were spitting out all sorts of off beat, crazy noise. Not that I have any issue at all with the non-stop hit machine they turned into, but I think some people overlook that early 1990's period of theirs. Some pretty creative stuff going on. It's hard to express why I feel compelled to spend $325 on a record that I already have two versions of. I assume it's some sort of sickness, but I just have this thing about having a complete collection. Anyone who has followed the Rocket From The Crypt discography will know that trying to complete this collection is a foolhardy task. There are so many weirdo variations and errors and other assorted things keeping the collectors always searching, but I'm getting closer. 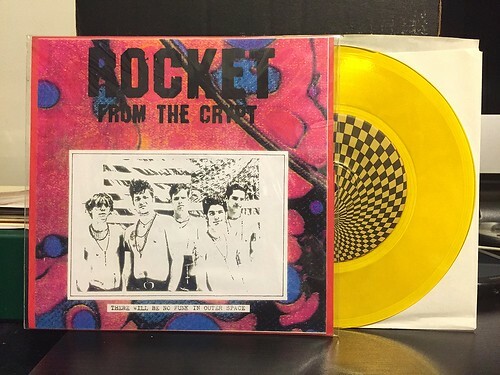 I think (and this is only true until the next bizarre variant is discovered) that I only have one more Rocket From The Crypt 7" left to find. So as I've said a few times, if you have a lead on the Pure Genius 7" on red vinyl, please let me know. I'll happily overpay for it.